The 30-day ordering window ended Feb. 20 for the five World War I Centennial Silver Medals. The latest U.S. Mint sales figures show 62,660, or about 62.7%, of the potential 100,000 sold. The silver medals commemorate branches of the U.S. Armed Forces that were active in the First World War with designs honoring the Army, the Navy, the Air Service, the Marines and the Coast Guard. The set with the Army medal scored the most sales at 15,577. It was following by the Marine set at 12,603; the Air Service set at 12,474; the Navy set at 12,206; and finally the Coast Guard set at 9,800. The following table shows how the other sets compare and also provides sales of the still available WWI Centennial Silver Dollars. 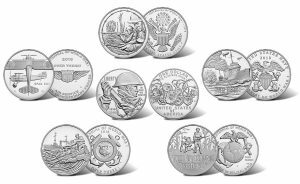 Buy WWI Silver Dollars from the U.S. Mint’s commemorate online store right here. Individually sold dollars are shipping. (See WWI Silver Dollar photos.) The U.S. Mint said it will begin fulfilling set/medal orders in late May. Observation: With total sales of the WWI Commemorative Proof Silver Dollar – that is, individual units plus medal set inclusions combined – at over 102,000 now and WWI Commemorative Uncirculated Silver Dollar sales currently at just around 16,000, what might one be able to surmise about the possible relative value of these two types of coins down the line? Old Collector – private sale = what ever anyone is willing to pay, but to a dealer = melt value. US Mint struck silver medal for San Francisco Cab Car Centennial sells for about 40 dollars. Mintage 10,001. There are many many example of lower mintages available on the cheap. Does the Mint even still sell stuff? They stopped mail order. They may want to edit the article. Unless my math is wrong – isn’t the sale of the Marine set at 12,603 higher than the Air Service? Looking at the overall sales of just over half the allowed mintage – collector fatigue for overpriced silver has reached a breaking point. Commemorative coin sales over the last couple of years has slowed, partly because of the horrible designs, extremely high price relative to spot price, and subjects that don’t have massive popular support – at least in the collector community. I bought the set as a Veteran – not for the resale value – but for the subject. This breaks a long standing trend on boycotting modern commemorative coins for me. I bought this because I liked the coin/medal set and realize I may not get my money back but I wanted it. The Mint needs to cut their cost and get these down closer to spot value and they may find sales increase. Until then the sales will continue to drop. Cincinnatus, thanks for catching the order problem. The article was updated. Thanks Mike – I have to look out for my beloved Marine Corps! I’ve got an idea: any of these medals that do not sell (congress should) have one sent to a surviving family member – who lost a Family member to the war – / of each branch of service as a thank you for their family sacrifice for the flag. Honor. First, this time the Mint decided to take orders for the exact number wanted so theoretically there shouldn’t be a single one of them left over after all the sets are shipped out to the customers in May. Secondly, if you believe our Congress is interested in doing that sort of thing I certainly hope you don’t hold your breath waiting for it to happen because you will sooner rather than later be turning bluer than blue. Old Collector – as per usual you are right on the money. Congress would do no such thing and that is sad. The designs on these medals are works of historical art and should go to to those who not only love numismatic art but also understand sacrifice. Happy coin/precious metals investing Mouse! we can’t fire the best president since teddy roosevelt can we. Seth – I always look forward to your education and comments…”fire” the Donald lol That man is locked in for at least one full presidential term – good or bad. Don’t ever worry about the Donald messing with precious metals, to many players involved and China would never stand for it. Just imagine if China called in the US loan / debt – all international currency would crumble. The Donald knows this and will play nice in the sand box – behind closed doors that is lol He knows how to play the international wealth game / he has done it for years, its a chess match. You would also not make a good politician because a) you don’t have an innate sense of entitlement; b) you are not given to either ego-and/or-megalomania; and c) you don’t have a heart of stone. Clearly, you are completely unqualified for public office. Old Collector – that is one of the best complements I have received in a long time and yes you are right on the money. I could never be in office – to honest and will always advocate and protect those who dont have. To long have the 2 per cent taken from those who cannot protect themselves from a system designed to keep them down. Democracy is only a word, its those who stand as one that make change – come back 1960 lol rock the cage lol – peacefully. Protect your wealth – love coinage – currency – bullion. it does have solid in your hands value, now and later. I remember 1967, the time of the “Summer of Love”, as one of my favorite years. I was twenty years old, full of energy, anticipation and eagerness, and now, over fifty years later, I continue to cherish the memory of being part of the “counter-culture” of that time. In fact, no “old” music still affects me more to this day than the likes of “Everybody get together, you gotta love one another right now” or “The answer my friend, is blowin’ in the wind, the answer is blowin’ in the wind.” And, likely as no surprise to any of us, fifty years later we’re still under the thumbs of the 2% and their assorted and various minions.